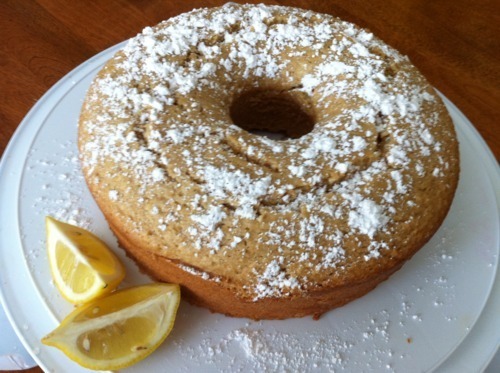 Just one of many amazing recipes from Veganomicon: The Ultimate Vegan Cookbook, this Coconut-Lemon Bundt cake will not disappoint! Check out the recipe below, and forgive me for the lousy camera-phone photo; my real camera is currently out of commission. 1. Preheat the oven to 350 and lightly grease your bundt pan. 2. Combine sugar, oil, coconut milk, rice or soy milk, lemon juice, lemon zest, and vanilla in a large bowl. 3. In a separate bowl, combine flour, baking powder, baking soda, and salt. 4. Add the dry to the wet in batches, mixing well. 6. Pour batter into pan, and bake for one hour. 7. Let cool for ten minutes, and then gently flip over to release cake from pan. 8. After the cake has cooled, sprinkle with powdered sugar.